Construction vehicles stand ready to remove concrete from the Great Works dam in Bradley as demolition starts to take place Monday, June 11, 2012. The Great Works dam stretches across the Penobscot River from Bradley to Old Town. This aerial photo, taken Monday morning, June 11, 2012 shows the breaching of the Great Works dam on the Penobscot River between Old Town and Bradley. 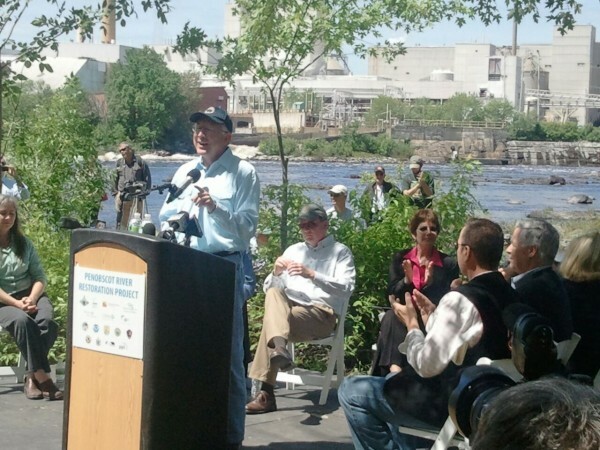 United States Secretary of the Interior Ken Salazar speaks before the Old Town dam removal begins on Monday, June 11, 2012. Crews start to hammer away at the Great Works dam on Monday morning. Great Works dam aerial photo from April 13, 2012. 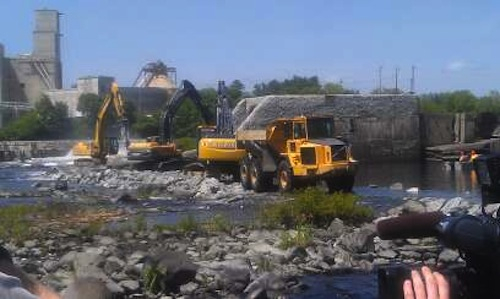 BRADLEY, Maine — Workers began removing the Great Works dam late Monday morning, part of a historic effort to open nearly 1,000 miles of habitat to 11 species of fish that haven’t had open access to the Penobscot River for two centuries. U.S. Interior Secretary Kenneth Salazar joined about 300 conservationists, government officials, tribal leaders and residents to witness the first tangible step in what has been a 13-year push to revive the river. The Great Works dam stretches across the Penobscot River from Bradley to Old Town. The Veazie dam also is slated for removal beginning in 2013, the Milford dam will get a new fish lift, and a fish bypass will be built at the Howland dam. 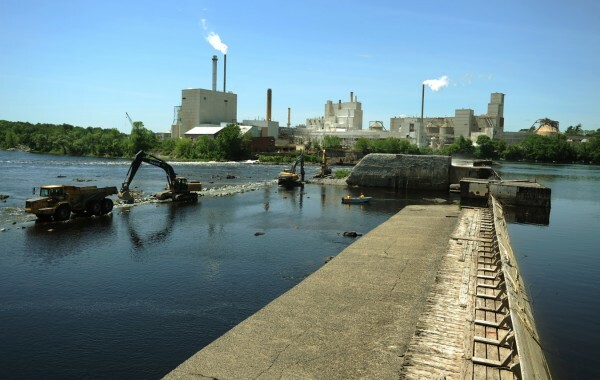 The project, led by the Penobscot River Restoration Trust, has been called the biggest river restoration project in the eastern U.S. and is expected to cost about $62 million. Crews from Ellsworth-based R.F. 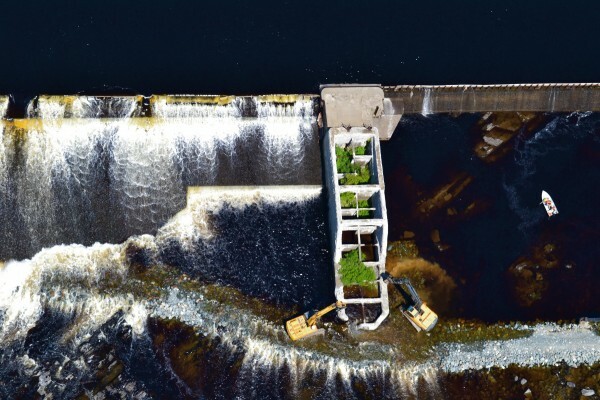 Jordan & Sons Construction Inc. used two excavators with hoe ram attachments — essentially large jackhammers — to break apart the fishway portion of the 1,000-foot-long dam piece by piece. A third excavator scooped up debris and loaded it into a dump truck that hauled the rubble off site. Demolition is scheduled to be completed in November. Dams, overfishing and pollution have drastically cut the number of sea-run fish that make it north of Bangor in the Penobscot. Before humans began altering the river, between 75,000 and 100,000 Atlantic salmon traveled through Bangor on their annual runs, according to the restoration trust’s deputy director, George Aponte Clarke. Today, only about 1,300 make it that far. Between 14 million and 20 million river herring made it upriver in the past, while fewer than 1,000 make it today. Those fish populations will begin to bounce back in the years after the removal of the dams, fishery experts and trust officials have said. The recovering fish population will boost economic growth and ecotourism opportunities in the Penobscot watershed, according to trust director Laura Rose Day. U.S. Reps. Mike Michaud and Chellie Pingree spoke at Monday’s event and U.S. Sens. Olympia Snowe and Susan Collins sent staff members to read written statements. The politicians lauded the restoration project as an example of collaboration among utilities, conservationists and fisheries groups that at one time clashed over the future of the river. The restoration trust is made up of 17 conservation groups, the Penobscot Indian Nation, government entities and corporations. 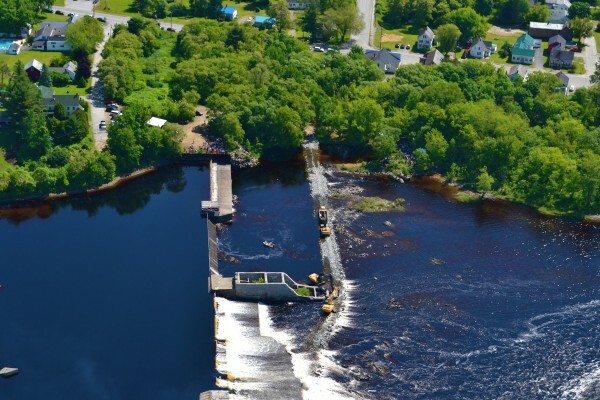 Salazar announced during the dam removal event that $2.5 million in federal funds will go toward Penobscot River restoration efforts, and Eric Schwaab from the the National Oceanic and Atmospheric Administration said that agency will kick in another $1 million. The Penobscot Indian Nation has been a longtime advocate of the river restoration project and was one of the early members of the trust. During the ceremony, before workers began chipping away at the dam, tribal elder Butch Phillips said the river is an integral part of the tribe’s culture. “The ancestors are smiling today,” he said. Penobscot Chief Kirk Francis said the removal of the dams will reunite the tribe with its historic homeland and the customs and traditions that come along with a thriving river, which he described as the lifeblood of the tribe for thousands of years. 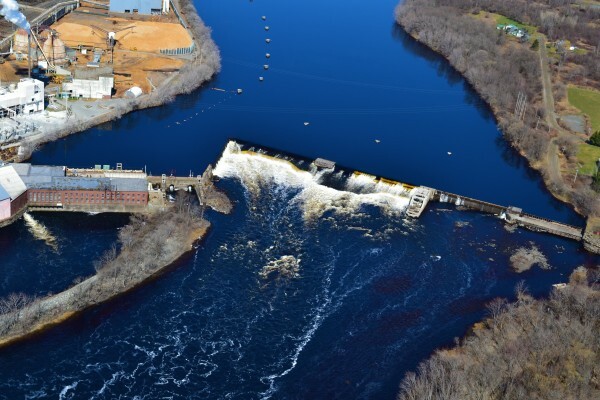 The dam removals will not reduce energy production on the Penobscot, according to the trust. Black Bear Hydro Partners LLC, owner of the dams, received approval in September 2011 to upgrade the Stillwater and Orono dams to eliminate the energy production gap left by the demolition of the Great Works and Veazie dams. Gov. Paul LePage criticized the dam removal plans during a press event last Wednesday at which he announced the first listing of Maine’s “business-friendly” communities. Maine Department of Marine Resources Commissioner Patrick Keliher, who spoke at Monday’s event on behalf of the governor, said LePage’s comments stemmed from his support of hydroelectric power as an important asset in Maine’s broader energy policy. Those goals include increasing economic and business prospects as well as rebuilding fisheries and reviving the river, he said. Keliher said he expected runs of salmon, shad and striped bass to rebound dramatically in the years after the dam removals. “Though there is no salmon fishing here today, the best chance we have in Maine to once again have a fishery is to fully implement this project,” the commissioner said. The complex river restoration deal got its start in 1999, after Pennsylvania-based PPL Corp. purchased dams along the Penobscot River. The company soon started having discussions with the state, Penobscot Indian Nation, U.S. Department of the Interior and several Maine conservation groups to hash out solutions to issues involving hydropower relicensing, migratory fish passage and restoration of the river. Under the 2004 agreement, PPL would sell six dams in Milford, Orono, Stillwater, Ellsworth, Medway and West Enfield to Black Bear Hydro, and the restoration trust later would purchase the Veazie, Great Works and Howland dams. Those deals came to fruition. In 2009, PPL sold the six dams and their associated hydropower assets to Black Bear Hydro for $81 million. The next year, the trust bought the dams in Veazie, Old Town and Howland for $24 million with plans to demolish the Veazie and Old Town dams and build the fish bypass in Howland. Editor’s note: Bangor Daily News Publisher Richard J. Warren is co-chairman of the Penobscot River Restoration Trust’s capital campaign and U.S. chairman of the Atlantic Salmon Federation, one of the partner organizations of the trust.